Reports and analyses from around the world are presented at MW2005. It is a trend among museums to not only encourage understanding or appreciation of exhibit content but also encourage behavioural change among visitors after their exhibit experience. Exhibits focusing on wildlife and habitat conservation, nutrition and health, advocacy, and family learning/literacy all hinge on making a change in the visitors' behaviour after they leave the museum. Yet there is surprisingly little research about how often museum exhibits, much less museum Web sites, actually lead to changes in visitor behaviour. To promote further discussion and research in the field, we review some of the challenges and promising examples in the museum field. We also review some of the considerations that went into the development of Conservation Central, selected Best Museum Web site at Museums and the Web 2004, which we developed for Smithsonian's National Zoo. We conclude by proposing a set of Web site guidelines that include goals for encouraging behavioural change among visitors. As in exhibit development itself, goals for museum exhibit Web sites often start with idealistic and generalized goals to increase visitor understanding and appreciation of exhibits. But, after the momentary interactive session, do visitors do anything differently in their daily lives? For decades, this question has been central to visitor-oriented museums such as children's museums, whose goal is often to advocate for visitor well-being and family learning. The question is also increasingly central to zoos and aquariums, wildlife conservation organizations, and nature centers that focus intently on broadening their message to include habitat conservation and appreciating the global impacts of visitors' local choices. Health museums, advocating for healthful long-term changes in visitor behaviour, are increasingly looking for engaging ways to integrate these changes into visitors' daily routines. To these institutions, visitors' post-visit behaviour is central to the fulfilment of their mission, and yet it has tended to be more of an optimistic wish rather than a designed-for outcome. An exhibit Web site should actively support at least three hours of activity done away from the computer in the real world. In the museum world, there are a few notable examples of behavioural changes that were designed and mediated through Web and e-mail technology. The Phoenix Family Museum, for example, used its members' e-mail list to encourage members to create handmade yard-signs in support of a local bond issue (Van der Veen, 2001). The Monterey Bay Aquarium provided convenient Seafood Watch pocket cards in its exhibit (and on its Web site) to help visitors decide which varieties of fish are harvested sustainably and are the safest to eat, thus encouraging visitors/consumers to examine and potentially change their post-visit behaviour (Yalowitz, 2004, Korn, 2003). We should acknowledge that changing visitor behaviour in the real world away from the computer faces significant challenges. In a busy world, visitors are confronted with thousands of competing messages in the course of a day, many for the purpose of commerce. Corporations and organizations invest significant amounts of time and money developing often elaborate and seductive mechanisms to support behavioural change, from courting and keeping customers, to educational programs on smoking cessation, to convincing you why you absolutely must bleach your teeth to have a winning smile. In the museum field, there are some quite specific challenges. A museum visit itself may occur in the space of an hour and a half to three hours, and a visit to a museum Web site may often span from less than a minute to ten or fifteen minutes. From the learning perspective, the expectation that long-term learning and behavioural change will occur after a ten-minute visit is unrealistic. Usually, we in the exhibit and Web design field are not accustomed to designing for behavioural change. Often, our goals are to 'increase understanding and appreciation' of the topic, without consideration of tools that visitors can use to take the next steps. In the instructional design field, one of the early design steps is to do a task analysis, breaking a learning goal down into its subset components, and then analyzing any prerequisite skills or conditions needed to achieve the goal (Gagne, 1985). For example, before installing an energy-saving light bulb, the user would need to know where to purchase it, the wattage to get, and that the savings over years will more than compensate for the more expensive up-front purchase price. We need to quickly convince visitors that it makes sense to make this change. We also need to make the purchase easy - with a simple click on a link, or by getting an e-mail reminder 'shopping list' for the next time they visit their local hardware store. The visitor who doesn't know about a Web site will not spend time engaging in it. There are both technical and non-technical approaches to overcoming this challenge, including e-mail reminders and mention of the Web activity in member newsletters, etc., as well as mention of the Web resources within in-house programs and events. Transferring a learning goal from one location (an exhibit or Web site on habitat conservation, for example) to a response in another location (an activity in a local woodland) is a significant challenge in a hustle-bustle world. If the message doesn't appear at the right time and place (at the breakfast table on Saturday morning before plans are made), it will most likely be lost. Fogg (2003) notes the ancient Greek principle of kairos - finding the favorable moment - to suggest a change in behaviour. In addition, other researchers have noted the potential of portable devices such as PDAs (Semper and Spasojevic, 2002) and 'ubiquitous computing' (Intille, 2002) to reach people at the right time and place. Conservation Central is a Web site we developed that includes real-world behavioural goals. Initially, our primary goal in developing Conservation Central with colleagues at Friends of the National Zoo/Smithsonian's National Zoo was to focus visitors' attention beyond the immediate appeal of the enormously popular giant pandas at the Zoo, to the temperate forest habitat on which they depend. The approach is to use the popularity of this 'umbrella species' to draw attention to the conservation of this species and its habitat (Lumpkin and Seidensticker, 2002) and the valuable ecosystem services that forests provide. We also knew it was key to make local habitat connections, that temperate forest are also in our own backyards, thus linking North America and Asia. We focused on carrying a message of conserving biodiversity and finding balance between the needs of people and pandas to the Web sites' two major audiences: families (at home), and middle school science and social studies teachers and students. As we developed plans, we felt that simply understanding the message wouldn't be enough to create a successful Web site. 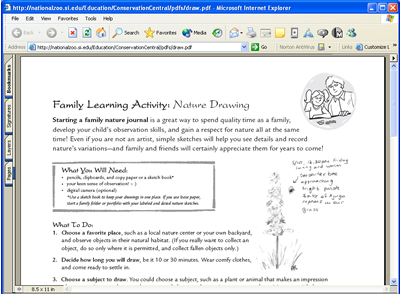 A conservation Web site implicitly includes a desire to increase conservation behaviour among Web site users. So we included in design plans specific ways that users at home and in the classroom could follow up, away from the computer, on steps that could foster habitat conservation locally, nationally and globally. We list below some of the key features that encourage these behaviours through Conservation Central. Our goal was to develop a structure to the overall Web site that would lead users from a path of immediate engagement in the initial activity to more in-depth exploration and, finally, to behavioural change in the real world. Our assumption was that before users would engage in the real-world behavioural activities, we would need to get their attention, and their delight, with an activity that would generate enthusiasm for further exploration of the site. Design a Panda Habitat thus became the first activity at the top of the page. Users can create a new giant panda habitat at the Zoo by dragging objects such as Climbing Trees and enrichment objects such as Fruitcicles into the habitat. If the user includes a variety of objects from all categories, the two giant pandas walk out into the habitat on 'Opening Day' and interact with the objects users placed. 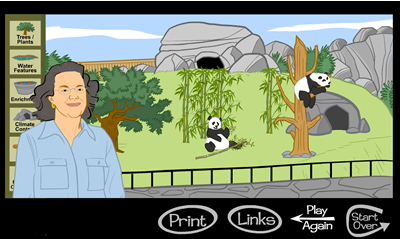 This five-to-ten minute activity did indeed turn out to be highly appealing to visitors, and led them down a path of increased exploration time in Habitat Adventure: Panda Challenge, and opportunity for greater depth and hands-on, post-visit behavioural activity in A Walk in the Forest and Family Learning Activities, and Finding Common Ground, the downloadable curriculum. This principle of leading with a highly-engaging activity is of course not new. In fact, in the world of theme park design, Walt Disney himself spoke of designing his park using visually appealing structures within a visitor's sight-range to motivate movement in that direction (McLean, 1993). Today, the new field of captology developed by Fogg (2003) describes some of the ways computers may influence people through intentional design strategies, and also speaks of the importance of engaging the user from the start. Finding Common Ground, the print and downloadable PDF inquiry-based curriculum, provides the instructional framework for teachers who would like to integrate the on-line interactives in their classrooms. It also provides another possible avenue to arrive at the Web site. Hands-on, real-world curriculum activities in each module provide action steps that may be integrated into the culminating activity of a class conservation action plan. The goal here is to have students reflect on what they have already done (action steps in each module), making the final action plan much more manageable by being broken into focused action steps. For easy use by busy teachers, we also aligned all activities with both science and social studies national learning standards, helping to create opportunities for team teaching and school-wide learning. To encourage creative and critical thinking, we provided more in-depth content that teachers could use with their students, encouraging them to become 'experts' on a subject and to make well-informed choices. 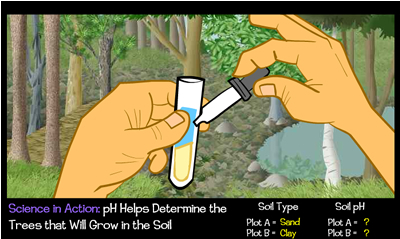 A Walk in the Forest, a series of six Flash interactives, engages visitors with authentic tools and scientific methodologies used by Smithsonian scientists to monitor the biodiversity of a virtual Virginia forest (designed after a real Virginia forest), and then to use these same tools and methodologies in a local woodland. Multi-age Family Learning Activities provide a thematic link to the curriculum activities, reinforcing the skills and concepts in an outdoor learning environment. One of the family learning activities, Family Conservation Action Plan, builds connections between school and home by providing a simple printout that students can take home, supporting behaviour change at home and school. In the children's museum world, family learning theory as described by Borun (1998), Dierking (1989) and others has provided an enormously popular approach to exhibit design. Social interaction between visitors is central to learning, according to family learning theory. And, to be specific, conversations between visitors are the key measure of whether an exhibit is encouraging learning (Borun, 1998). One of our central goals was to extend this approach from the museum exhibit environment to the home computer environment. For each activity, we asked ourselves: How would a parent and child interact if they sat down together? Would they talk about what they are doing, or just click through it? Are there opportunities to connect the topic to their own lives? These questions informed the pace of text bubbles and availability of narration used in animated sections of the Web site. One of the surprises that became apparent as we developed this relatively high-tech site was the power of a simple and attractive one-page printout, the format we selected for the Family Learning Activities. A one-page PDF printout becomes the bridge from the computer to the real world, making it easy to post the activity up on the refrigerator until the visitor is ready to head outdoors. In addition, a materials list and step-by-step procedures make the activity simpler and more compelling. In the classroom, we designed one-page student action sheets so students could easily add them to their Action Plan Portfolios or Habitat Journals. In the course of developing Conservation Central, we focused increasingly on promoting behavioural change among users. While acknowledging the difficulty of reaching into the visitors' lives and promoting a behaviour that occurs away from the computer, we feel that the following guidelines provide a good start to developing Web sites that go beyond promoting simple understanding of the exhibit topic. The most basic starting point is simply to ask, 'What does the visitor do, away from the computer, as a result of this program?' It is helpful to visualize the user at home or in school, and imagine the process of going from the computer to the real-world activity. Because long-term learning is something that takes more than a few minutes to encourage, it is important in our view that a Web site encourage at least three hours of real-world activity. Ideally the learning could occur over the course of several weeks, including activities such as keeping a nature journal or joining an ongoing program at the Museum. It is also important that it not be cumbersome for the visitor to change his or her behaviour and that the outcome of the change provide concrete value (dollars saved, pounds of CO2 emissions saved, etc.) and social/psychological rewards (feeling good, doing your part, making a difference). Emotional memory is powerful and enduring. Research has shown that providing a variety of sensory experiences increases the chances of memory retention. Experiences such as looking at baby animals that increase oxytocin levels (sometimes called the cuddling or social contact hormone) can elicit care and empathy behaviour. This may be an opportune time to introduce a choice behaviour that may help protect an endangered species that is widely considered 'charismatic, adorable and cuddly'. Zoos understand that, in addition to species conservation, the birth of a baby panda, for example, increases visitors' awareness/caring, and that may translate into both increased donations and behaviour change. We can reward and reinforce choice behaviour by showing financial and social/emotional rewards. It is easy to simply suggest activities such as 'visit a local farm stand and buy local, organic produce.' But in practice, with the buzz of messages that constantly surround visitors, the suggestion is unlikely to make a lasting impression unless the behavioural steps seem easy and attractive. Where are the local farm stands? (Is there a Web site that lists them by state and town?) How do I get there without much fuss? (A map) What's so much fun about buying local potatoes? (A local harvest menu to customize and print out) Why should I spend the extra money to buy organic produce? (Health benefits of not eating pesticides, less negative impact on land) The more specific we can be about the users' skills and motivation, the more likely we will be to change their behaviour, especially if this change has positive social rewards. Providing simple changes people can make in daily life, such as replacing one light bulb with an energy-saving light bulb, empowers visitors by making a large-scale, seemingly overwhelming problem manageable. The combined synergy of everyone doing something, large or small, has a measurable financial and energy-saving impact as well as a positive social/psychological impact on consumers who are motivated to make a change. Providing ways for visitors to become involved in a limited time commitment activity is another good way to introduce a choice behaviour. After visitors see the positive results, they are more likely to make the change a habit. Because of the competition for users' attention in daily life, it is essential to capture their interest from the start. The lead activity is a good place to spend more on the animation budget, and to focus on multi-outcome games and activities that will attract repeat visits. In the case of family-oriented exhibits, it is also the place to encourage parent/child collaboration, since it is the parent who can more readily set the course for real-world follow-up, such as visits to the local zoo or a walk in the local park. Given the lack of universally available PDAs or cell phones, in our view the best link to the real world from the computer is often a PDF printout. PDF documents have an affordance that naturally suggests 'print me.' And documents to print, if cleverly designed like the Monterey Bay Aquarium's Seafood Watch pocket card, are the best link to being in the right place at the right time to change users' behaviour. The success of the PDF lies in the creative spark it may foster (example: attractive name cards for the dinner table with healthful eating suggestions), and the step-by-step resources that make the behaviour seem doable, compelling, and worth doing. Visitors won't engage in Web site activities if they don't know about them. In the case of Conservation Central, we've been fortunate that it has received recognition from a number of museum groups, including AAM (Silver Muse Award in science), Museums and the Web 2004 (Best Museum Web site), and National Association of Interpreters (1st Place, multimedia category). Each award presents new opportunities to generate publicity about the site, both through e-mails to Zoo members and in paper-based newsletters, newspapers, and journals targeted to families and teachers. E-mail reminders and action alerts sent to museum members at times when the content is particularly relevant (such as the birth of an animal) may provide the momentum for visitors to change their plans or behaviour, encouraging activities such as reading with their child about animal births. As developers, it motivates our creative design process to know that the museum will take specific measurements of the success of an activity. Simple measures may include a record of downloads of a particular PDF or visits to a particular Web page – though, of course, these don't indicate actual follow-up away from the computer. Our colleagues at Friends of the National Zoo included a helpful Protect the Planet Pledge on the Conservation Central Web site: it provides a measure of behavioural engagement. The best measure would be an easy way for a visitor to provide feedback after doing a real-world activity, such as visiting an interactive gallery space or a collaborative action alert section of the exhibit Web site. Given global concerns about habitat conservation and the environment, coupled with the social and cultural challenges of life in a pluralistic society, the shared mission of many museums, zoos and aquariums, and conservation organizations has been to move visitors beyond understanding of topics, to behavioural change and advocacy to make the world better for all living things. More museums are looking for effective tools to support behavioural learning at a distance via the Web. Using the strategies we have outlined, we can move visitor experience beyond appreciation towards action in the real world. We can translate compelling on-line experiences into concrete action that endures long after visitors turn off the computer. Borun, M., et al (1998). Family Learning in Museums: The PISEC Perspective, Philadelphia: PISEC/The Franklin Institute. Dierking, L. (1989). What research says to museum educators about the family museum experience, Journal of Museum Education 14(2): 9-11 as cited in Falk, J., and Dierking, L., (2003), Learning from Museums: Visitor Experiences and the Making of Meaning. Walnut Creek, CA: Alta Mira Press. Fogg, B.J. (2003). Persuasive Technology: Using Computers to Change What We Think and Do. San Francisco: Morgan Kaufmann Publishers. Gagne, R. (1985). The Conditions of Learning and Theory of Instruction. New York: Holt, Rinehart and Winston. Intille, S. (2002). Designing a Home of the Future, IEEE Pervasive Computing, April-June 2002, 80-86. Lumpkin, S., and J. Seidensticker (2002). Smithsonian Book of Giant Pandas. Washington DC: Smithsonian Institution Press. McLean, K. (1993). Planning for People in Museum Exhibitions. Washington DC: Association of Science-Technology Centers. Van der Veen, K., (2001). Participant in panel discussion chaired by author Larson, “Using Technology to Extend Place and Experience” at Association of Youth Museums (AYM) national conference. St. Louis, May, 2001. Yalowitz, S. S. (2004). Evaluating Visitor Conservation Research at the Monterey Bay Aquarium. Curator, 47 (3), 283-298.